Random House Trade Paperbacks, 9780812981629, 336pp. In this delightful sequel to her bestseller Tender at the Bone, Ruth Reichl returns with more tales of love, life, and marvelous meals. 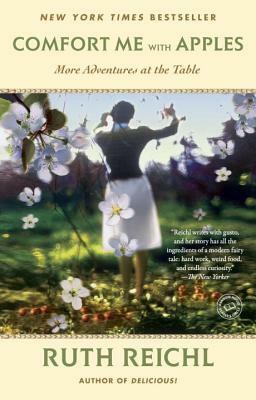 Comfort Me with Apples picks up Reichl’s story in 1978, when she puts down her chef’s toque and embarks on a career as a restaurant critic. Her pursuit of good food and good company leads her to New York and China, France and Los Angeles, and her stories of cooking and dining with world-famous chefs range from the madcap to the sublime. Through it all, Reichl makes each and every course a hilarious and instructive occasion for novices and experts alike. She shares some of her favorite recipes while also sharing the intimacies of her personal life in a style so honest and warm that readers will feel they are enjoying a conversation over a meal with a friend. Ruth Reichl is the editor in chief of Gourmet and the author of the bestselling Tender at the Bone, a James Beard Award finalist. She has been the restaurant critic at The New York Times and the food editor and restaurant critic as the Los Angeles Times. Reichl lives in New York City.